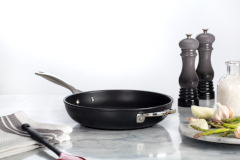 Le Creuset has created a full range of fry pans, with every cooking surface to meet your needs. 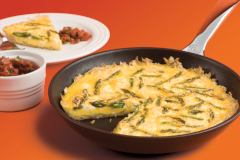 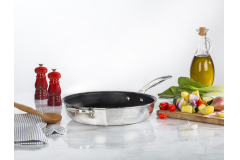 Signature Enameled Cast Iron fry pans make it easy to fry, sear or bake a variety of foods either on the stovetop or in the oven. 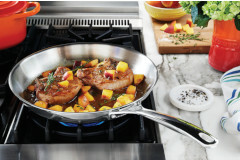 With it's long handle and easy grip helper handle, one can easily maneuver the fry pan from cooktop to oven to tabletop. 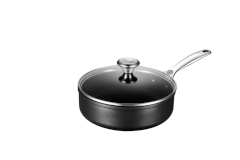 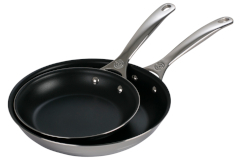 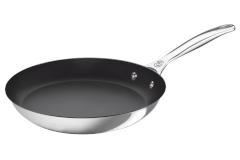 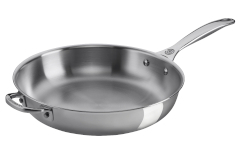 The fry pans feature a matte black enamel interior which aids in browning and does not need seasoning. 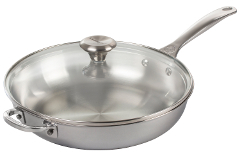 The Stainless Steel range is elegantly crafted by European artisans for superior performance and a radiant, lifetime luster. 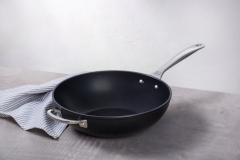 The new Toughened Nonstick Collection delivers the ease of unsurpassed nonstick performance with a PFOA-free triple-reinforced coating, making it perfect for healthier cooking with less oil or fat.